In the rapidly changing business and technology environment, manufacturers are striving to stay competitive, now and into the future, by increasing productivity and lowering costs. 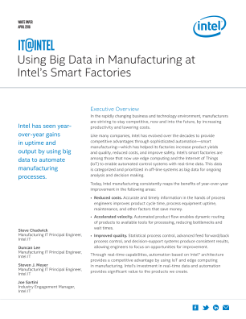 Like many companies, Intel has evolved over the decades to provide competitive advantages through sophisticated automation—smart manufacturing—which has helped its factories increase product yields and ...quality, reduced costs, and improve safety. Intel’s smart factories are among those that now use edge computing and the Internet of Things (IoT) to enable automated control systems with real-time data. This data is categorized and prioritized in off-line systems as big data for ongoing analysis and decision making. Reduced costs. Accurate and timely information in the hands of process engineers improves product cycle time, process equipment uptime, maintenance, and other factors that save money. Accelerated velocity. Automated product flow enables dynamic routing of products to available tools for processing, reducing bottlenecks and wait times. Improved quality. Statistical process control, advanced feed forward/back process control, and decision-support systems produce consistent results, allowing engineers to focus on opportunities for improvement. Through real-time capabilities, automation based on Intel® architecture provides a competitive advantage by using IoT and edge computing in manufacturing. Intel’s investment in real-time data and automation provides significant value to the products we create. Complete a simple sign up form and an Intel® IT Advisor will contact you within 2 business days to provide you with individualized assistance.